It's a lovely cottage in fantastic surroundings. Lots of touring and walking. We all had a great time and will be back to Lochcarron. Couldn't wish for a more lovely place to stay. Thank you. Fantastic week!!! Fresh flowers, shortbread and milk, a very thoughtful gesture. Best equipped cottage we have stayed in. We've really enjoyed our week in this cottage! Beautiful area with very kind people and breath-taking walks. Thank you! Lovely cottage, very well equipped. The view from the cottage is wonderful and the area is marvellous. A place where we have to come back. We stayed at Bruaich in April 2017 and it was everything we wanted. 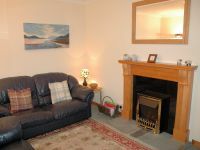 A warm cosy cottage in a quiet and peaceful setting, it had fabulous surroundings with lovely views and was very close to Lochcarron. We walked into the village every day and enjoyed meeting the locals who all made us feel very welcome. 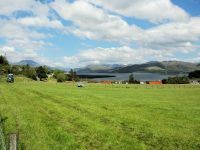 Lochcarron has a lively community with great shops and crafts, and we were able to join in with some of these as well as tasting some of the great food on offer. Debbie had thought of everything when equipping the cottage and we were very comfortable during our stay. She also came to visit us to make sure we had everything we needed. We LOVED staying here and will definitely be back. Thank you Debbie and "Visit Lochcarron" for a wonderful holiday. Bruaich Cottage has been beautifully renovated and tastefully modernised and was given a 4-star rating by Scottish Country Cottages whilst being let by them. 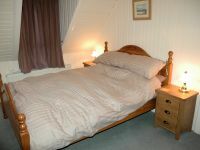 The accommodation in the cottage is as shown below. Please follow the links to view the details of each room, including photos. Alternatively, you can view the cottage in its entirety, both inside and out, via the Virtual Tour above. The sitting room is cosy with a traditional fireplace with electric coal-effect fire. 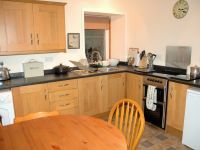 The kitchen in Bruaich Cottage has recently been re-fitted to a high standard. 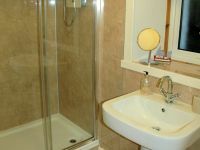 The bathroom (shower Room) in Bruaich Cottage is on the ground floor just off the hall. 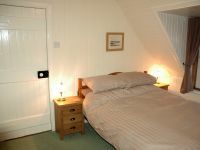 The bedrooms have pine-lined walls and ceilings and are cosy and welcoming. There are superb views from the bedroom windows. 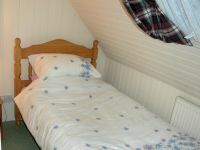 The single bedroom is small but comfortable and has a full-size single bed. It is an ideal room for a youngster or teenager. The front door of the cottage opens into the hallway from which there are doors to the kitchen/dining room, the living room and the bathroom. 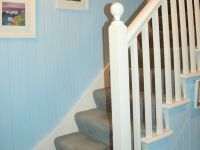 Upstairs are the 3 bedrooms. 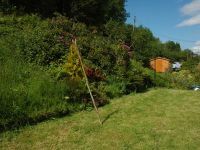 The rear garden at Bruaich Cottage, Lochcarron, slopes upwards steeply but there is a level, grassy area at the foot of the slope which is quite well sheltered. Bruaich Cottage stands at the side of a quiet side road towards the west end of Lochcarron village approximately 1 mile from the main centre of the village.